As I looked at this picture of Arnfinn from last Saturday, some thoughts came to mind. He had just finished an 80 km bicycle competition from a small town in Sweden across the border into Norway. 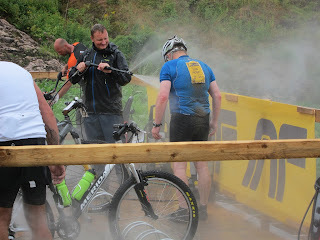 I dropped him off and waited a few hours at the finish line where he arrived happy, exhausted, and very dirty. According to "The Free Dictionary" CLEAN means being free from dirt and pollution. In the photo this is obviously the goal before putting Arnfinn and his bike in my clean car. What more does clean mean? There is more to is than clean drinking water, clean air, and a clean house. Not infected means a clean wound. A clean throw is free from clumsiness. A clean getaway means a successful escape. A clean voting record says a person has no marks or discredit. A clean manuscript needs few alternations. A clean fighter is honest and fair. Being clean can means not carrying a weapon nor being accused of a crime. A clean joke is proper for all audiences. Being clean can mean not addicted to drugs. It's a movie with Nick Nolte. Its a name for home remedies, home schooling, classroom materials, energy, beauty products, a programming language, an Indie rock band from New Zealand, an so on. Clean fuel means a more efficient engine. The list goes on and on. I have to admit that to clean is on my list, not always among my favorite chores, not always fun, but so rewarding. A clean house makes me feel great and seems to lift my spirit. But there's more to it. To lead a clean life means being morally pure and virtuous. It is having a clean conscience, not living a life where one hurts oneself or others. There's always hope. There's always time to change things in our life. Get rid of dirt. It can be improving little things in our life or starting a new chapter. After all, a clean page means starting anew. 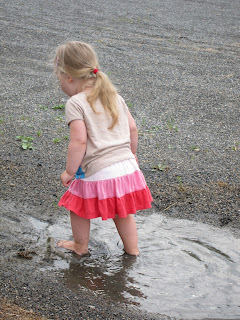 Photos of Arnfinn and our munchkin, the mudpuddle fairy, Sienna.